Coco Swan has always been embarrassed by her name. With a name like Coco, she thinks people expect her to be as exotic and glamorous as the famous designer, not an ordinary-looking small-town antiques dealer who could win an award for living cautiously. But when a vintage Chanel handbag turns up in a box of worthless bric-a-brac, Coco's quiet world is turned upside down. Where did it come from? And is it just coincidence that it's the same bag Coco's late mother always wanted for her? When Coco discovers a mysterious, decades-old letter hidden in the bag's lining, she sets off on a quest to piece together the story behind it, stumbling across secrets that span three generations as she goes. Could the beautiful Chanel bag be about to teach Coco more than she wants to learn? Or will it show her just where her heart can take her if she lets it lead the way? 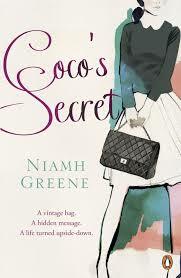 Coco’s Secret is the first book I have read by author Niamh Green and after reading this one it won’t be my last. Coco Swan bids on an auction lot and finds a rare gem at the bottom of the box, a genuine Chanel handbag. Coco is momentarily unsure what to do with the bag, her mum had always wanted Coco to have her very own Chanel bag, but when she finds a hidden letter inside she has second thoughts about keeping it and decides to try and find out more about the owner. I loved the mystery surrounding this storyline, all the way through you never knew if Coco would solve her little mystery and this is what kept me gripped. Coco was a very down to earth, loveable character and it was great to see such a homely woman push herself out of her comfort zone to follow the trail, along the way she begins to live her life rather than just plodding along with every day routines. The supporting characters in this book were all a great addition to this book, both Cat and Ruth provided a little entertainment. The romance in this book was teasingly short but it meant the storyline really focused on the history of the bag and its owner rather than being overshadowed by romance. I enjoyed the supporting characters storylines, they brought a nice little addition to a what was already a great storyline. I did feel as though the ending was a little rushed, I think an extra chapter or two would have been great just to see how certain things panned out I know we have all got an imagination so we can make up our own Happy Ever After but I just think this would of finished off what is a fantastic book perfectly. I think this is a heart-warming, easy read with a nice air of mystery, I thoroughly enjoyed this book and cannot wait to get my hands on more of this authors work. Online store of love stories. Read popular romantic book published by Harlequin. Lovely review, I hadn't heard of this author.